Most industrial equipment, for indoor or outdoor use, contains extensive electrical wiring between its components and subsystems. 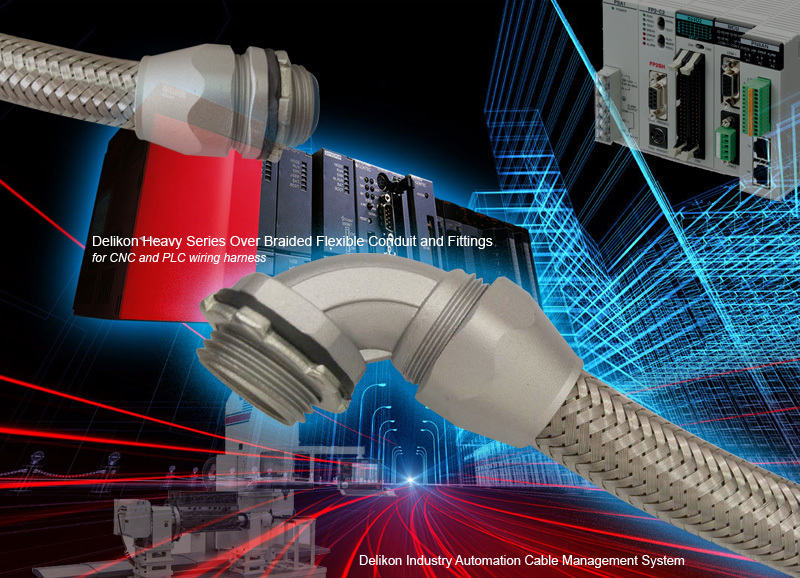 Delikon Heavy Series Over Braided Flexible Conduit and Fittings are designed to protect PLC, CNC Controls cables, Servo and Spindle Motors cables, MPG Cables, Drive Command Cables and cables in industry automation. Delikon Heavy Series Connectors simplify design, assembly and maintenance for CNC machining center and other modular machinery. The over braided flexible conduits metal braiding is normally connected to earth via the heavy series metal connector to provide an electrical shield to screen the internal conductors from outside electromagnetic interference.It is widely used for protecting the input cables of PLCs where the voltage and current levels are low. With Delikon Over Braided Flexible Conduit System, these low level signals are screened from the interference generated by cables carrying higher power voltages and currents. 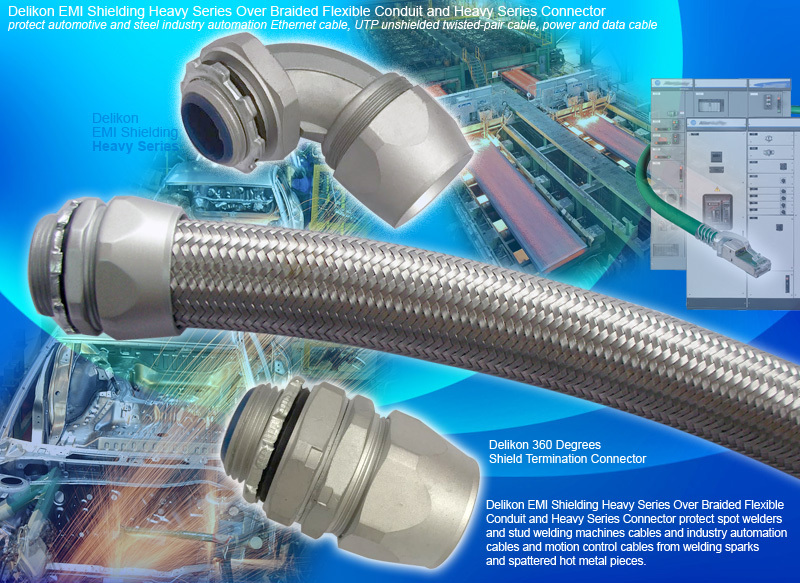 Delikon Heavy Series Over Braided Flexible Conduit and Fittings are optimized for industry demanding operating conditions or requirements, harsh weather, extreme heat or corrosive environments, high load applications or where shielding from electromagnetic interference is required. Delikon is a technology leader in the design, manufacture, and supply of high-performance electrical flexible conduit and fittings systems for a broad range of industrial applications, including medical equipment, factory automation, heavy equipment, instrumentation, motion control, rail mass transportation, alternative energy, and natural resource exploration. Today, most state-of-the-art- hospitals, five star hotels, business process outsourcing centers, manufacturing plants, telecommunications organizations, commercial buildings, data centers, emergency facilities, large industries, and mining companies require uninterrupted power and have backup engine generators. Delikon Heavy Series Over Braided Flexible Conduit and Fittings are designed to protect ignition wiring and control wiring of industry Engine and Generator. The male or female threads of our connector could be customly produced for connection to military connectors, mil-spec connector, aerospace connectors, aircraft connectors, medical and industrial connectors. Delikon offers one of the largest selections of industrial wiring electrical flexible conduit and fittings. Delikon manufacture flexible conduit assembly for Cable Assemblies and Wire Harnesses in markets including: military, aerospace commercial industries,medical, industrial, network communications, process control, transportation, and heavy equipment. Delikon flexible conduit assemblies are built in accordance to strict specifications. 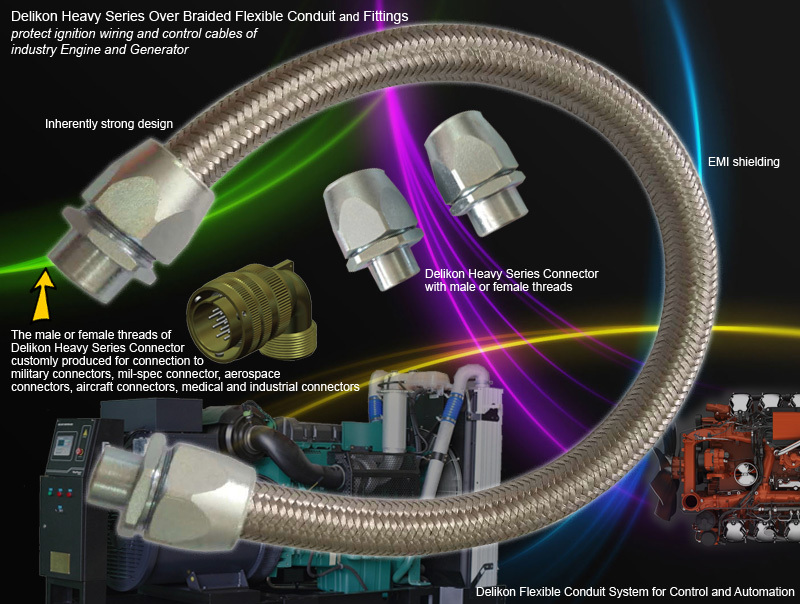 The flexible conduit systems need to protect the connection from harsh environmental factors and their inherently strong design allows them to do so. Harsh environments similar to those found in water and wastewater facilities can affect the ability of an electrical conduit and connector to protect the cables contained within, leading to a multitude of problems. Problems can include dangerous system collapses, production downtime, personal injury, and increased long-term maintenance costs and losses in customers. Consequently, it is critical for specifiers to choose the right flexible conduit systems that prevent complications. 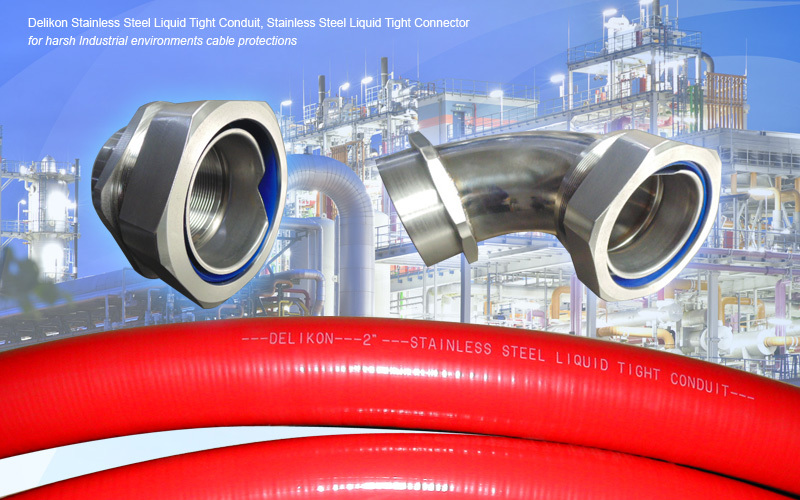 Ruggedly designed, engineered, and constructed, Delikon Stainless Steel Liquid Tight Conduit and Stainless Steel Connector provide solutions for harsh-duty manufacturing environments such as oil industry, automotive, food and beverage, material handling and commercial vehicles. With sealed, IP67 rating, Delikon stainless steel liquid tight conduit system is designed to withstand harsh Industrial environments. Delikon stainless steel liquid tight connectors patented anti-vibration feature prevents back-out in high vibration applications.